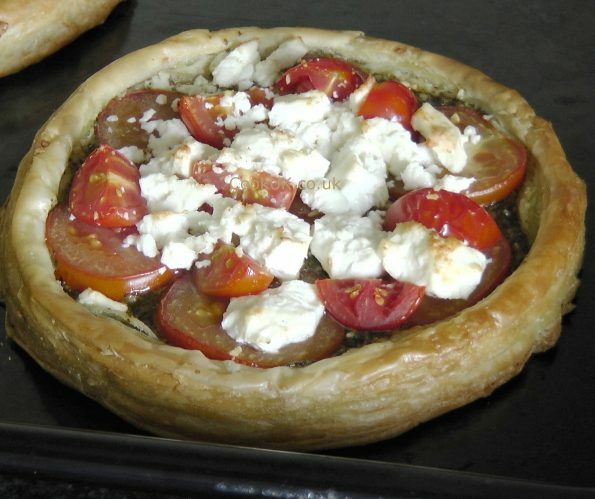 Sweet tomatoes combined with salty and slightly tangy feta cheese, all in a puff pastry case. Delicious individual meals for less than £2 each. : One large oven proof baking tray. Sprinkle flour over a flat surface then unroll the puff pastry and cut into two circles (use a plate as a guide) 18cm / 7in wide. Roughly mark out a 1½cm / ½in border on the pastry circles. Slice the 2 medium tomatoes. Using your fingers crumble the feta cheese into small bits. Grease the baking tray with a little oil or butter. These easy to prepare and cook tartlets are super tasty as they are but its foolproof to add a few more ingredients if you want. Scatter over some chopped sweet pepper to add a little more sweetness and a slightly crunchy texture. If you are not a vegetarian then a sprinkling of chopped ham or chorizo goes extremely well. For the amateurs amongst us, the ready rolled pastry is normally found near the butter and cheese section in a supermarket. If they don't have any then use the frozen puff pastry which in our supermarket is found somewhere near the ice cream. This will need to be defrosted for a couple of hours and you will then need to roll it out. Place both puff pastry circles on the baking tray. 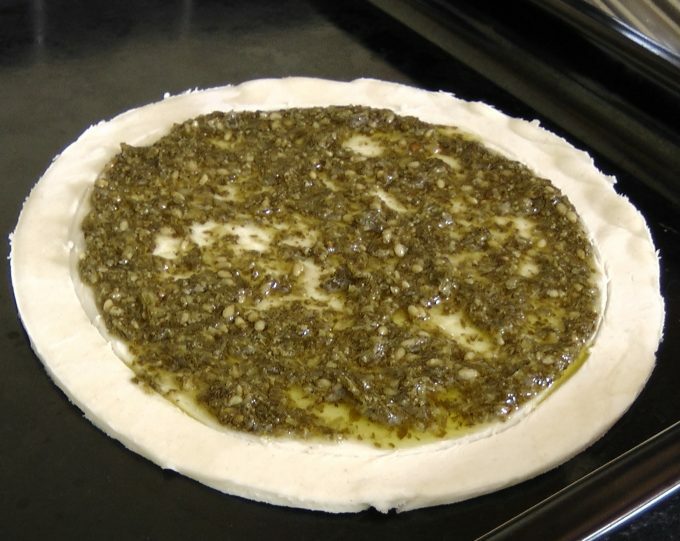 Using a blunt knife spread one tablespoon of pesto onto each pastry circle keeping it within the marked out border. Spread half the tomato slices over the base of each pastry circle. 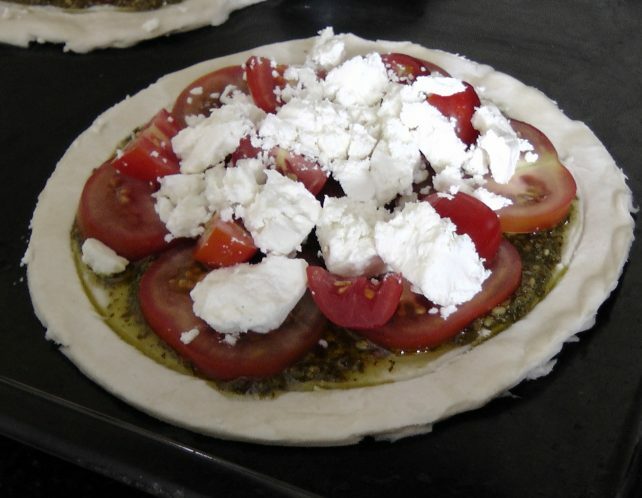 Scatter half the feta cheese bits and tomato quarters over the pastry circles and sprinkle over the olive oil. Place in the pre-heated oven and bake for about 15 minutes until the pastry is golden brown. Garnish with some torn basil or parsley sprigs, the remainder of the feta cheese and eat immediately with a fresh salad.